Of course that day never happened and I did sometimes find myself thinking about that bread. Luckily, I had saved the recipe because the blog I found it on no longer exists. I thought, “I wonder what it looks like on the inside? I wonder how wonderful it smells while it’s baking? I wonder if it tastes as great as it looks?” Flash forward a year and I am happy to say there was a beer in my refrigerator and I had the opportunity to make this super easy and super delicious bread! I had a bottle of Stella Artois beer on hand. I think you could use any can or bottle of your favorite beer (as long as it’s 12 ounces). I will say that now that the pumpkin ales are back in the markets, that is the beer of choice for my next round of this tasty and sort of healthy bread. Hey! I used 1 cup of whole wheat flour and even through a little ground flax seeds into the recipe. Nobody noticed that it was sort of healthy. The beer flavor is very subtle. When you slice it once it’s right out of the oven, it is delightful. Our neighbors came by for a visit and we were enjoying our very fall Florida early evening. The mosquitoes weren’t that bad and the temperature was perfect for a nice chat, some hot honey beer bread and a cup of the soup I just finished making. Sort of an impromptu dinner al fresco. With everyone busy with work, school, sports…a relaxing visit with old friends is just what we all needed. You can put this very easy recipe together in less than 10 minutes. It is perfect alone or go ahead, slather on a little butter while it’s still hot. It’s really nice on the side of a flavorful fall soup (I’ll soon share a few recipes I’ve made!). Do you have a bottle of beer hidden in your fridge somewhere? You do? Ok, then nothing should stop you from making this bread. Don’t wait a year like I did. If you would prefer it without whole wheat flour, totally fine. Don’t have any ground flax seeds around, no problem. In a large bowl, whisk together the flours, ground flax seed, sugar, baking powder and salt. In a small bowl, combine the beer and honey. Stir the beer mixture into the flour mixture until combined. Pour half of the melted butter into the loaf pan. Spoon the batter onto the butter. Poor the rest of the melted butter onto the batter and with a pastry brush spread it evenly around the entire surface of the batter. Bake for 1/2 on hour at 350 then lower the heat to 325 and bake for about another 30-40 minutes, or until a skewer inserted in the center comes out clean. It will be hard to wait for the bread to cool before serving to slice. Mmmm I just saw a pumpkin beer bread on another blog and this one looks and sounds just as good, too. I better start buying beer! It looks great and sounds like it would go perfectly with sweet for a snack as well as savory. With soup does sound like a great autumn meal! I've recently begun to enjoy beer – as long as it's not light (too many college flashbacks!). 😀 I'll be sure to pick up some pumpkin ale, this bread looks amazing!! I love beer and I love honey and I love bread. It's gotta be a great combination. Pinning this one to make soon! 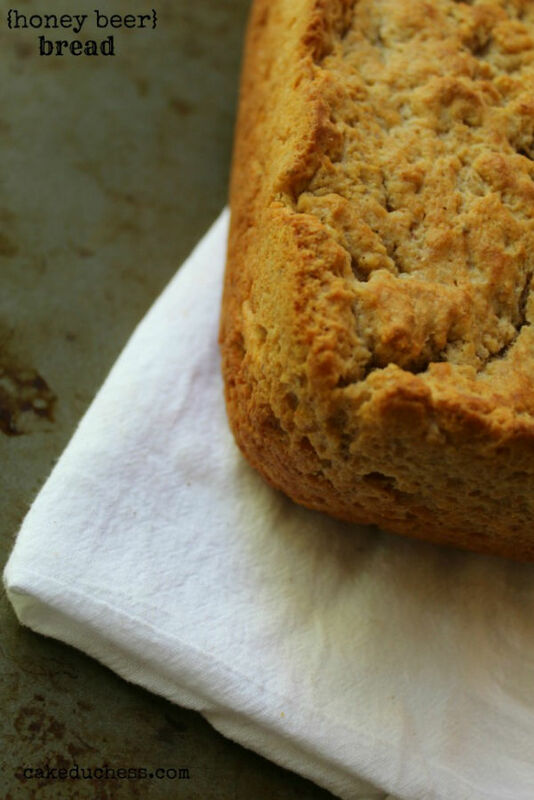 This would be such a great bread to go with fall soups, can't wait to try it! Beautiful beer bread, Lora! Love that you made yours with honey. There seems to be a big baking with beer trend going on right now. 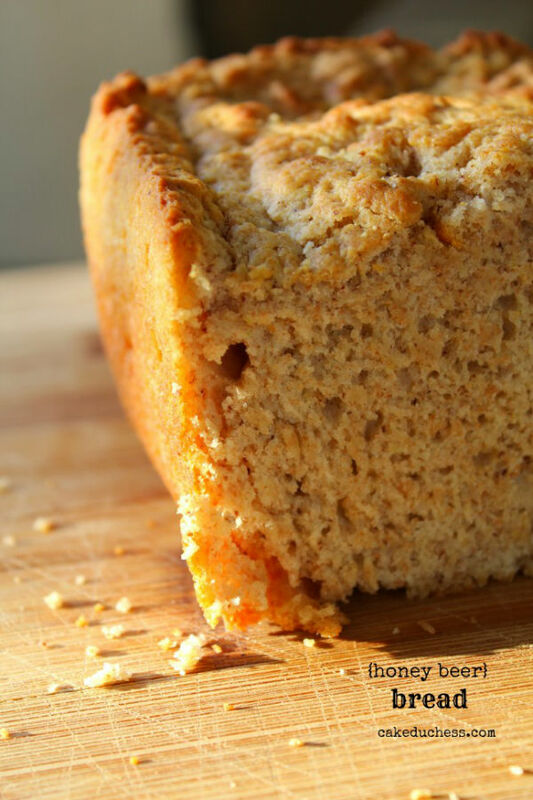 I made a gluten free white Cheddar beer bread last year. Although I am following you at Bloglovin' (it shows that I am), when I clicked to "Read Blogs", and selected yours, it says "There are no posts from the past week." Also, I'm not getting your feed. Very weird. Going to re-follow and hope that helps. Anyway, I'm so glad I stopped by! I want this in my toaster right now! Hi Karen-It is a great combo…super easy and so good! Thank you for the pin! I can only imagine how tasty this is as toasted bread!